Imagine the late great Khalid Muhammad dropping a Hip Hop single about ending Systematic White Supremacy. Geri D' Fyniz called on the spirit of revolution from his ancestors. With his record he didn't beat around the bush nor sugar his agenda in the music industry or life. This record is the anthem to ending Systematic White Supremacy. It offers just enough 808 boom and snare drum pop to command your attention. The lyrics then keep your attention by urging you to recognize and eliminate any threat against your survival and the survival of anyone about Black Empowerment. 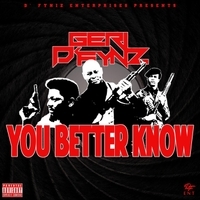 This record was Written, Performed, Recorded, and Produced by Geri D' Fyniz of D'Fyniz Enterprises.